The bottle is too small for what is required so I literally have to fill the bottle up about 3 or 4 times to get the recommended daily amount. 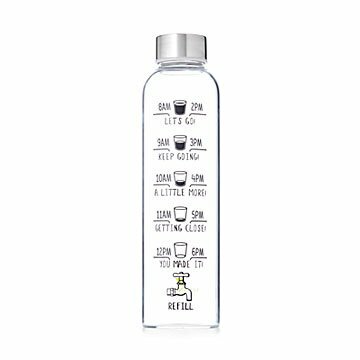 The times on the bottle are great however it's only about the size of a 16oz bottle of water when you fill it up. I thought it would be bigger. I had a check-up at the doctor recently. There were a few issues I needed to talk to the doctor about. In this age of Web MD/internet diagnosis, you think everything bad could be cancer. Well it turns out I just had the signs of dehydration. I needed to drink more water. There are some very cool people I work with that have this bottle. I asked where they got it, and I was told Uncommon Goods. Immediately I went and bought one and was on the path to hydration. I brought it home and my wife asked about my awesome water bottle, so I had to get one for her as well. 20oz is a good size. I like that the bottle is glass. It is a more adult version of the plastic water bottles my kids use. Just make sure to hand wash on a regular basis and you will be all good! I loved this bottle. I am just the kind of person that needs accountability and the markings helped me stay hydrated as the day went on. Alas, it fell out of my backpack and broke! If only it came with a protective sleeve that was open to the markings it would be perfect. I wanted to track my drinking. For some reason I thought this would hold at least 1 and a half to two water bottles. (Fell in love with look did not read the description) it literally holds one water bottle. Less than a quarter more. I feel as if I could just aim to drink two bottles of water a day on my own.